Henry married Sarah Alicia Arrowsmith on 27 Jun 1852 in St Pancras but their first child, also Henry George - 'Harry' - was not born until 1859. (Perhaps they had children who died in this period, never living long enough to appear on a census and with such a common name, not identifiable.) In 1861 Henry is listed as a carpenter at 4 George Court, only a block away from Charing Cross Station, a narrow street off the Strand on that side. and may have lived in one or two other places in those 'unmarked' years. Living with them in 1861 was Frank Arrowsmith ('Francis W.' Sarah Alicia's brother. (Arrowsmith family) who was a warehouseman aged 25. By 1871 they had moved to Bedfordbury, not far away and still in the parish of St Martin in the Fields where Henry, still working as a carpenter, now had five children, Harry being 11. Frank Arrowsmith had probably moved into London from Chatham in the 1840s with his mother, Sarah (formerly Alderson) and was living with her in 1851 and working, at 15, as an errand boy in Finsbury. It must have been Henry's move to Bedfordbury that encouraged him to decide to emigrate, plus the offer from the British Government of free (?) passage and land in Alberta, Canada. Sarah's daughter Ada recalled, in the 1950s, her mother writing to him on Sundays 'in her brown silk dress', but unfortunately she did not recount anything he might have written back! Alberta was very much 'wild west' frontier territory at that time! Henry George Cope was the eldest surviving son of William Cope, founder of the coffee house at 35 Commercial Rd, Lambeth. He was born in 1831 at 63 Cornwall Rd but he moved over the river to live in Chapel St, Somerstown just before his marriage in 1852. It must have been after Henry left, perhaps about 1855, that William himself also moved, but a very short distance, round the corner from the 'eating house' on Cornwall Rd, into Commercial Rd, presumably to larger - and more prominent - premises at no.35, next door to a pub, no.34, one of many named as the 'Dover Castle'. (The street was renamed Upper Ground St many years later to distinguish it from the Commercial Rd on the north side of the river). William's wife Sarah had died in 1866. By 1877 William was aged 79. There was no 'retirement age' in those days but it is very doubtful if he was still working as a sawyer, and he would certainly not have been able to manage the coffee shop by himself. He would not have been living alone and the fairly obvious conclusion, in view of what happened, is that at least by 1877 - and even perhaps a few years earlier - Henry George had already moved from Bedfordbury to the coffee shop though working as a joiner for Eyre and Spottiswoode, but no doubt with Sarah Alecia helping out. It was on 18 October that year that Sarah died in St Thomas's Hospital in Lambeth. She may have been ill for a while. Their eldest child, Harry, was now about 17, Elizabeth 15, Frank 12, Ada 10 and William 7. There is only one stroke on the census dividing these two properties and the 1881 census treats both properties as parts of one with John Brown at no.34 as 'head'. In the circumstances this is an understandable mistake. No 34 at that time was not identified as a public house, nor as the 'Dover Castle' but there was no real 'head' at no.35 as William Cope had 'retired' - probably due to his poor eyesight, and his obvious heir, Henry, had died only at the end of that January. There was Henry's widow, his second wife Sophia whose position is unknown and must have been uncertain, and his son, Harry who was barely 21 and working as a joiner. It seems likely that the family did not want Sophia to run the shop. She was not 'old' at 43 but is not found on any other census or in death records subsequently, leaving many unanswered questions; especially her place of birth as transcribed. Beddington Oxfordshire must be incorrect, being non-existent and the reading more likely to be Duddington Northants, in which case her surname was Bowden, though even that yields no answers as to who she was, just one of the many great 'unknowns' from the countryside who had to work from a very early age, flooding into London for work in the 19th century - she probably never had a settled home life. Although the census describes her as 'mother' she had no children of her own, had only been 'mother' for two years. Harry could have taken over the running of the shop almost immediately. 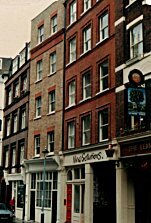 The entrance to no.35 must have been as a typical shop; Ethel Barnes, Henry's granddaughter remembered it as it must have been even before WW1, and more details were supplied by Harry's grandchildren, cousis Betty and Geoffrey, like the tables, presumably seating four, set out with their red check tablecloths. There was a counter at the front of the shop with fresh food displayed for sale. and somewhere on a windowsill or display stand was one of Harry's (sailing) ships in a bottle - making these was a hobby of his and one was even on show at the Polytechnic (probably in the twenties). Sarah Alicia was the eldest daughter of Nicholas Arrowsmith and Sarah Alderson and was born in the village of Hoo St Werburgh, near Rochester in Kent. Though many of her family were born in Kent they had earlier connections with what is now part of London as her paternal grandmother was born in Southwark and her paternal grandfather died in the Hanover Square area of London which had overcrowded and down at heel districts as well as some of the more fashionable 'squares'. The Arrowsmiths were somewhere between the two, Sarah's aunts then living in Bloomsbury, two of them listed as 'independent' and another a dressmaker in 1851. By 1861 all three were together running a fancy toy shop in Islington and then by 1871 two of the were in the more 'genteel' occupation of 'governess', having moved to Putney, a rather more countrified area. Nicholas probably died before 1841 - he was certainly ill in 1837 and 'deceased' by the time Sarah was married. Neither he nor his wife Sarah [Alderson] have been found in the earlier censuses, and nothing is known about the latter other than her birth date. They had three children, Sarah Alicia in 1832, Ellen Jane in 1834, and Francis (aka Frank) in 1836. Whether Ellen Jane survived is unknown as she also has not been found, but Francis was lodging with his sister Sarah Alicia in Finsbury in 1851, then aged 15, Sarah being employed in an Oil and Italian warehouse. Francis was an errand boy, presumably in the same warehouse and probably still in 1861. 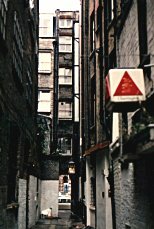 He was then listed as a 'warehouseman' and still lodging with Sarah and Henry Cope and their one year old son Harry at 4, George Court, in the last house on this narrow street, next to the Strand, sharing the dwelling with one other family. It is known that Francis emigrated to Alberta - Sarah's daughter Ada remembered her mother writing to him on Sundays, 'in her brown silk dress' (i.e. her Sunday dress) but he has not been found subsequently. He perhaps travelled on one of the government's schemes where pioneers were promised land in Alberta, still a distant largely unexplored part of Canada, though he might equally have headed for one of the sparsely scattered towns - he obviously had some sort of postal arrangement, if only for collecting mail. Presumably after Sarah Alicia died in 1878, soon followed by Henry in 1881, there was no-one else left to keep up the correspondence. Whether Henry met Sarah Alicia Arrowsmith before he moved or after is not known but he was living in Somerstown when they married. Sarah Alecia Arrowsmith (known as 'Sal') had come from Chatham to Somerstown and was living in Skinner St. They were both still 'juniors', that is, not yet 21 years old and they began their married life at 4 George Court, a narrow ginnel just off the Strand. Sal's brother, Frank, lived with them and it was here that Henry George junior was born, November 20th 1859. There were 2 other lodgers as well, a plumber, Alfred Bowker and a warehouseman called William Puddicombe who came from Exeter. All the children except Ada were baptised at St Martin in the Fields, on the corner of Trafalgar Square. Ada was taken further afield to St James', Westminster, for some unknown reason. Frank was named after his uncle, Frank Arrowsmith, the one who lived with them until he emigrated to Alberta, Canada. William was called after his grandfather, with Phipps because it was his grandmother's maiden name. Henry senior was a carpenter and joiner and is also listed as a greengrocer in 1862, when living in 2 Bedfordbury, just north of Trafalgar Square. These houses - with shops on the ground floor even then - were typically occupied by two or three families. The Copes remained in Bedfordbury till at least 1872, appearing in a directory there till 1873, having moved no further than next door, perhaps to a larger apartment, as their five children were born. There is no evidence whatsoever for another son.Thomas Cope, born about 1864, only a misreading of the badly written and very difficult to read 1871 census, which is actually a record of Francis, then 7, for whom there is plenty of excellent evidence. Lilian, Henry's daughter, was supposed to have claimed that her uncle Thomas had once swum right across the Thames - she must have been referring to Thomas Barnes! 1. Henry George, William's eldest surviving son, referred to throughout as 'Harry' to distinguish him from his father, married Alice Pemberton on 27 Jun 1852 at the church of St Pancras, Middlesex. Their story belongs to the next fifty years of the coffee shop and continues here. 2. Follow the link to Elizabeth Caroline to read how Lizzie became lady's maid to Mrs O'Shea whose marriage to Charles Stuart Parnell in 1891 caused a sensation in the newspapers of the time. Her sister Ada insisted that her visit with her mother (or step-mother?) for tea with Mrs O'Shea was 'long before the scandal' but Katie O'Shea's influence on the course of Lizzie's life was certainly of importance. A record has been found on FindMyPast of a 'Henry George' being apprenticed in 1877 to a Thames Waterman, who it turns out could only be Harry's aunt's stepson, almost but not quite a sort of 'cousin'. This is curious for a number of reasons but a search for any other possible 'Henry George Cope' of any age, though one would expect him to be about 10, (and not 17), has produced only two who are certainly not the apprentice. (Two others of the Cope grandchildren definitely did become lightermen later on, their boats being 'lighters'). As this concerns Harry the main account can be found on coffee3. 3. Francis, or Frank like his uncle, had the name William added, presumably after his grandfather William Cope, and then Phipps after William's wife, his paternal grandmother. He married Ada Maria Cummins (or Cummings) on 9 Sep 1888 at St Andrew's Church on Coin St. They had seven children all of whom were surviving in 1911. They haven't been found yet on the 1891 census but an Ada aged 2, the right age, turns up 'visiting' a family called Liberty in Southwark, along with an Ellen Cope who was 25. There were two births of an Ada Cope in the March quarter 1889 in Lambeth but one of them has no initial given whereas the other, the relevant one here, is listed at birth as Ada Louisa. Plain 'Ada Cope' appears again in 1901 with Ellen who was formerly Ellen Liberty, born in 1866 in Christchurch who had a daughter Ellen Elizabeth Liberty born in the Sep Q 1884 in St Saviour Southwark. Ellen Liberty married a Richard Cope in the Mar Q 1888 in the same parish and they had a daughter Ada Cope born in the Mar Q 1889. In spite of the confusion with the Cope name this family does not appear to be related to William Cope or his descendants but at the very least there need be no confusion of Ada Cope with Ada Louisa Cope, Frank's daughter. Ada is the only one missing from all the censuses from her birth onwards but Frank claimed in 1911 that none had died - and the other six are all present. It remains a mystery. 'John Walter Cope, grandson', aged 3 who was also present, at 10 Temple St Southwark could - just - be Alice's son, but it seems more likely that the missing Ada was his mother. A Walter John Cope was registered as born in Lambeth in the Mar Q 1910 but there is a lot of difference between a child of 1 and a child of 3 - hardly a mistake the family would have made. Henry George made his will on 25 Jan 1881, just three days before he died, leaving £300 to Sophia. (a will with limited availability being after 1858 so not consulted). 3. Ada Beatrice was said to be the only one of the Cope family not to have red hair! She married Thomas James Barnes on 22 Sep 1889, about three weeks before her 22nd birthday and died in her 90th year. Her story is told on the Barnes family page. 4. William Samuel Cope, was born in 1870 in Bedfordbury. His last 'public appearance' was on the 1881 census aged 11 and presumably still at school but about to leave. Both Lilian and also Ethel, her cousin, his nieces, reported independently that he was killed in the Boer War in 1902. No official evidence for this has been found but records of casualties in the Boer War are patchy. The story is probably true and he has not been found later so it is possible that he joined the army when he was about 18. A record of a 'W. Cope' who was a gunner, (soldier no. 75889 in the 74 Battery Royal Field Artillery R.A.) has been found but this could equally easily be someone else. There is no other likely record of a W.Cope on the very extensive list of Boer War deaths and casualties - claimed to be 'complete' - on the Find My Past website - the few others are either officers or must come from other parts of the country. The story of the next generation is continued in Coffee Shop (3) and Lizzie, the story of Henry's older daughter, Elizabeth Caroline, a 'formidable lady', who moved from rags to riches - and back - and met many famous people. The 'main line' continues with the Barnes family. Harry, Henry's eldest son, married Alice Pemberton on 27 Jun 1852 at the church of St Pancras, Middlesex. As their family ran the coffee shop for over fifty years their story is told on the third page of this series.